Von Willebrand disease type I (VWDI) is an inherited bleeding disorder affecting many breeds of dog. Dogs affected with VWDI have less than half of the normal level of von Willebrand coagulation factor (vWf), which is an essential protein needed for normal blood clotting. There is variability in the amount of vWf such that not all dogs with two copies of the Mutation are equally affected. Dogs that have less than 35% of the normal amount of vWf generally have mild to moderate signs of a bleeding disorder. Affected dogs may bruise easily, have frequent nosebleeds, bleed from the mouth when juvenile teeth are lost, and experience prolonged bleeding after surgery or trauma. Less often, the bleeding may be severe enough to cause death. Due to the variable severity of the disorder, affected dogs may not be identified until a surgery is performed or trauma occurs at which time excessive bleeding is noted. Veterinarians performing surgery on known affected dogs should have ready access to blood banked for transfusions. Most dogs will have a normal lifespan with this condition despite increased blood clotting times. Genetic testing of the VWF gene will reliably determine whether a dog is a genetic Carrier of von Willebrand disease I. Von Willebrand disease I is inherited in an Autosomal Recessive manner in dogs meaning that they must receive two copies of the mutated gene (one from each parent) to develop the disease. In general, carrier dogs rarely have features of the disease but when bred with another carrier of the same Mutation, there is a risk of having affected pups. Each pup that is born to this pairing has a 25% chance of inheriting the disease and a 50% chance of inheriting one copy and being a carrier of the VWF gene mutation. Reliable genetic testing is important for determining breeding practices. Because symptoms may be mild in affected dogs, genetic testing should be performed before breeding. In order to eliminate this mutation from breeding lines and to avoid the potential of producing affected pups, breeding of known carriers to each other is not recommended. Dogs that are not carriers of the mutation have no increased risk of having affected pups. 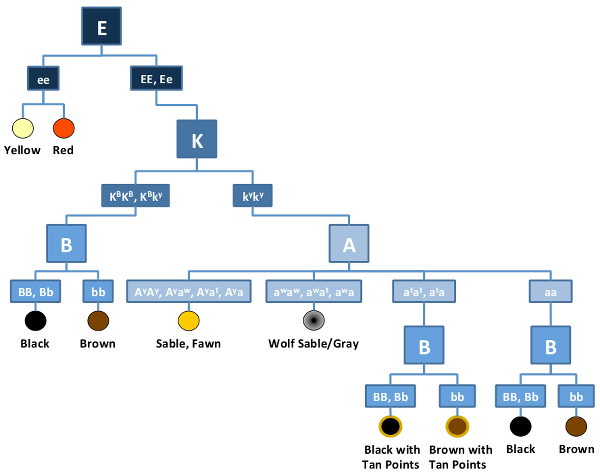 Shaffer LG, Ramirez CJ, Sundin K, Carl C, Ballif BC (2015) Genetic screening and mutation identification in a rare canine breed, the Drentsche patrijshond. Vet Rec Case Rep. 3:e000185.